Coral reefs worldwide are under threat from a wide variety of stressors and disturbances, many of which act in a synergistic manner to affect reef health. The future of coral reef systems at local, regional and global scales is highly uncertain, which poses a challenge to decision makers in designing appropriate strategies for managing human activities that affect reef resilience. Scenario analysis using simulation models can inform decision making by exploring possible futures under alternative management frameworks. 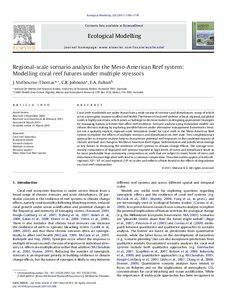 Here, we use a spatially explicit, regional-scale simulation model for coral reefs in the Meso-American Reef system to explore the effects of multiple stressors and disturbances on reef state. Two complementary approaches to scenario analysis help to characterize potential reef responses to the combined impacts of climate and land-use change in the Meso-American Reef region. Sedimentation and nutrification emerge as key factors in decreasing the resilience of reef systems to climate change effects. The average community composition of degraded reef systems exposed to high levels of stress and disturbance tends to be more predictable than community composition on reefs that are subject to lower levels of stress and disturbance because degraded reefs tend to a common composition. This observation applies at both subregional (104�5 m) and regional (106 m) scales and reflects a finite bound to the effects of degradation on coral reef communities.